Dilon and Woody Mason were born two minutes apart on an autumn day in St. Paul, Minn., identical twins who grew up worshipping the Green Bay Packers and Brett Favre and devouring bags of apples. Woody grew up healthy, despite his tiny (3.2 pounds) too-early arrival, but his older and slightly heavier (4.2 pounds at birth) brother was plagued throughout childhood by high fevers and illnesses. The Mason family never thought too much about that until, at age 15, Dilon was diagnosed with Non-Hodgkin Lymphoma. Their parents decided to treat the cancer with natural methods and assumed a positive attitude about their son’s recovery. And improve he did until the disease returned with a vengeance when the twins were 21. This time, Dilon received slightly more aggressive non-medical treatment and all was thought to be well for more than a decade during which time the brothers married and started successful careers, Dilon in business and Woody at Grand Canyon University. “That lasted until about three years ago when Dilon got really bad and wasn’t able to function, and the doctors said he only had six months left to live,” said Woody, an online full-time faculty member in the College of Education since 2010. Heavy doses of chemotherapy and stem-cell therapy, using blood donated by Woody, saved Dilon’s life last January. The experience left a mark on Woody who, along with his wife, Allison, an assistant dean in GCU’s Colangelo College of Business, and others from across the University community are planning to participate in the American Cancer Society’s Making Strides Against Breast Cancer. The non-competitive walk, scheduled for Saturday, Oct. 24, at Tempe Beach Park, raises awareness and funds for breast cancer research and patient and family services. GCU is a partner with the American Cancer Society on a number of initiatives, but its involvement in the Making Strides event, which falls during National Breast Cancer Awareness Month, is purely grass roots, she said. Although breast cancer often is thought of as a women’s disease, it impacts the physical, mental and emotional health of men and children, too, she said. According to 2015 statistics from the National Cancer Institute, 231,840 women and 2,350 men are expected to be diagnosed in the U.S. this year with breast cancer. Nationwide, more than 40,000 women are expected to die this year from breast cancer, which is the second leading cause of death of women behind heart disease. Quimba said everyone should be aware of the importance of annual breast evaluations and monthly self-examinations, research progress and advancements in genetic testing and other technology that aids early diagnosis, treatment and recovery. The Making Strides event offers that education outreach, in addition to being a leisurely walk around Tempe Town Lake at a beautiful time of year. GCU’s team leaders are Connie Colbert, director of the Canyon Health and Wellness Center, Brandon Warner of the CONHCP, Allison Mason of the CCOB, Cindy Seminoff of the College of Science, Engineering and Technology, Jennifer Jones of the College of Humanities and Social Sciences, Jonathan Sharpe of the College of Theology, Susannah Keita of the College of Fine Arts and Production, Arielle Alvarez of the Tempe office complex, Quimba, representing the Peoria office complex and Veronica Perez of the 27th Avenue of the office complex. 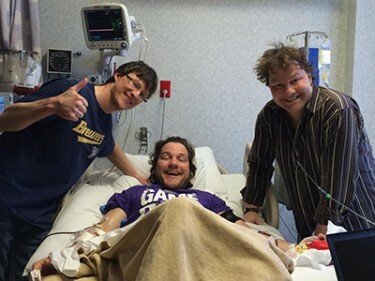 Woody, an online full-time faculty member at GCU, donated stem cells to his twin, Dilon, at a Dallas hospital in December 2014.
therapies and now, physical therapy and surgery to correct the damage inflicted by cancer. But for nine blessed months Dilon has been cancer-free, and feeling better every day. Woody, Allison and their two small children plan to walk at Making Strides because they feel strongly about supporting all cancer victims and their families. Later this year they are hoping to host a family reunion of the Mason parents, Dilon and his wife, and the twins’ two older siblings and their families for an Arizona Christmas. 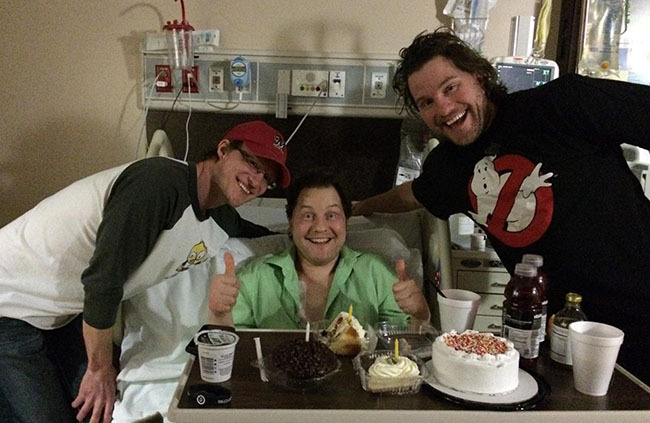 That may involve a birthday cake with candles and singing on Jan. 8, the date of Dilon’s “new birthday,” when his little brother saved his life. I graduated high school with these Woody and Dilon Mason, always joking around and friendly to all. Glad to hear everything has worked in your favor Dilon! Truly an amazing family! !